Prestige Venues and Events are our dedicated caterers who we work closely with to offer a unique dining experience here at Scotland’s most beautiful Castle. In this blog we talk to one of our newest chefs, the award winning Tom Beauchamp, about his passion for food and the menus that he created exclusively for us here at Dundas Castle. If you have any of your own questions please feel free to contact us! Where have you worked in the past and why? I have been fortunate to work in some great kitchens and with some fantastic chefs so far in my career. I have worked in a good variety of kitchen environments from small provincial restaurants to large hotels and at one of Scotland’s top tourist destinations. However, the most influential and important time for me previous to my current role has been the three years I spent working for Raymond Blanc at Le Manoir ax Quat Saison in Oxfordshire and with Andrew Fairlie at Gleneagles, Perthshire. I took the decision a few years ago to throw in my comfortable job as Head Chef with the Edrington Group and jump in to the very different world of two Michelin star cookery. It was a very tough time, the regimes in restaurants like this are incomprehensible to most people but it offers the chance to develop a level of skill, commitment and professional capability that is not possible unless you live that life for a significant period of time. Looking back, making that sacrifice was the best idea I have had. Where do you see trends in catering going? There are two different types of thought on this. There are many chefs who are constantly pushing the boundaries and developing new styles and trends within the industry and they meet with varying degrees of success. There is also the more traditional style of kitchen, based on the more classical type of cookery. Personally I prefer a combination of the two. I like to base all the dishes we do on solid proven technique but also to introduce a little flair and quirkiness. There has definitely been a huge shift in recent years towards addressing the providence and seasonality of food which is a great thing. Local, seasonal ingredients from top quality producers and suppliers are the foundation of good dishes. As for the future? Current trends are nodding towards a more naturalistic, Nordic style of cuisine but the great thing about this industry is that it’s constantly developing and chefs are finding new and exciting ways to work with food. What is your favourite dish on our menu and why? It would probably have to be the loin of pork and maple bacon with Cuddybridge apple. I’m a huge fan of pig. It’s definitely the most versatile and exciting meat to eat and work with. If you could create your perfect 3-course meal from our menus what would it be and why? For my ideal three course meal I would start with the tortellini. This is a slightly unusual dish but works amazingly well. The beautiful handmade pasta is filled with a contrast of earthy/sweet beetroot and creamy ricotta. The velouté is a very flavourful but also delicate blend of fresh herbs, vegetable stock and mascarpone. We then aerate it so it’s incredibly light and serve it with confit beetroot, watercress and shallot. The dish is very striking visually with a contrast of vivid green, deep purple and the handmade pasta. It’s a really delicious, light and eye-catching beginning to a meal. For the main course I would have to go with the beef fillet. I don’t usually choose fillet when I’m eating out as I’m quite adventurous but the Scotch beef we use is the best anywhere. Teaming this with the really rich bone marrow and mushrooms served on toasted brioche, the impossibly light and fluffy dauphine potatoes and the sweet slow cooked shallot is about as good as it gets for me. It’s a great illustration of how bringing some of Scotland’s best produce together with classic cooking techniques can result in a simple but memorable dish. For dessert the praline crème brulee would win it for me every time. I can’t resist these, they are my favourite dessert ever. Here we add a new dimension with the praline and caramelised hazelnuts. It’s a step away from the traditional but tastes amazing. It’s finished with milk chocolate ice cream which is probably a bit of an over indulgence but I can live with this, it is meant to be my perfect meal after all…..
Is there an ingredient or style of cooking that you would really like to try or work more with? Regarding ingredients, I love to try everything! Getting to taste so many different foods is one of the perks of my job. As for cooking styles, it would be amazing to get some experience of Japanese cuisine, it’s probably the most refined type of cooking on the planet right now. Why do you love working with Prestige Scotland and Dundas Castle? After spending so much time working in such controlled and confined kitchens as Le Manoir and Andrew Fairlies, the thing I love most about my new role is that no day is ever the same and you are constantly exposed to new challenges and new experiences. Working with a venue such as Dundas Castle is fantastic, the history, the building and the exclusivity of it are incredible. It’s one of the most beautiful places I have been to. I have an honours degree in economics, quite unusual for a chef. The best meal I have ever had in my life was in a small tratoria down a back street in Rome. We stumbled across it by accident and sat with four generations of the family who owned it and ate non-stop for over four hours, with all the food being cooked by the grandmother. It was a surreal experience, very rustic and simple but possibly the best quality produce I have ever had. It’s an absolute delight to work with Tom. 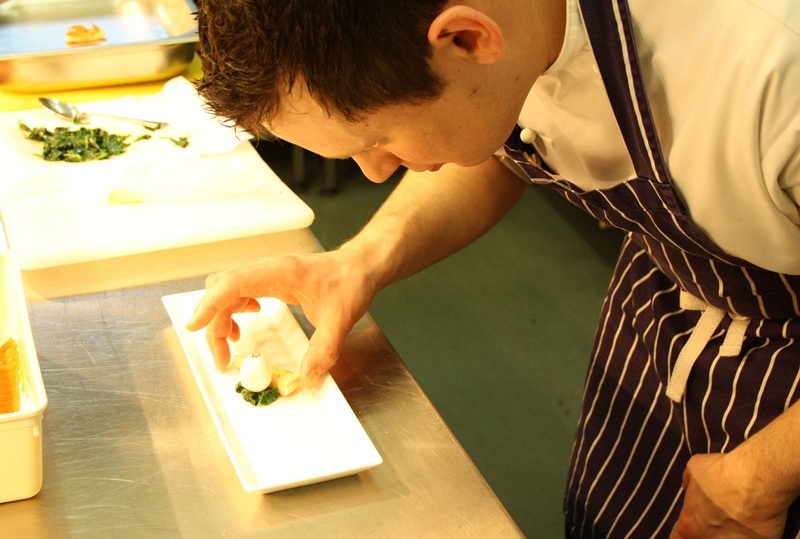 His forward thinking and creative flair ensure that any menus or dishes he creates wow not only our clients but us too. Whether it is a private celebration, a corporate event or a wedding, we can confidently give him a client brief and know that from conception to delivery the process will be smooth and the end product will be delicious. The team here at Dundas enjoy learning more about the food side of our offering. We have enjoyed ‘foraging’ with our head chef for ingredients such as pignut and sweet cicely and most recently were charged with creating a 3 course dinner for 10 from start to finish. From setting the table, to creating the dinner, to cleaning the last tea spoon we can see how particular a 5-star dining process is. When we speak to our clients we are able to answer questions regarding the dining experience but we do leave the intricacies to Laura and our team of catering professionals at Prestige Venues and Events. We are very proud of Tom for winning the Scottish chef of the year at the Sodexo championships and wish him lots of luck when he competes in the UK final later on this year.